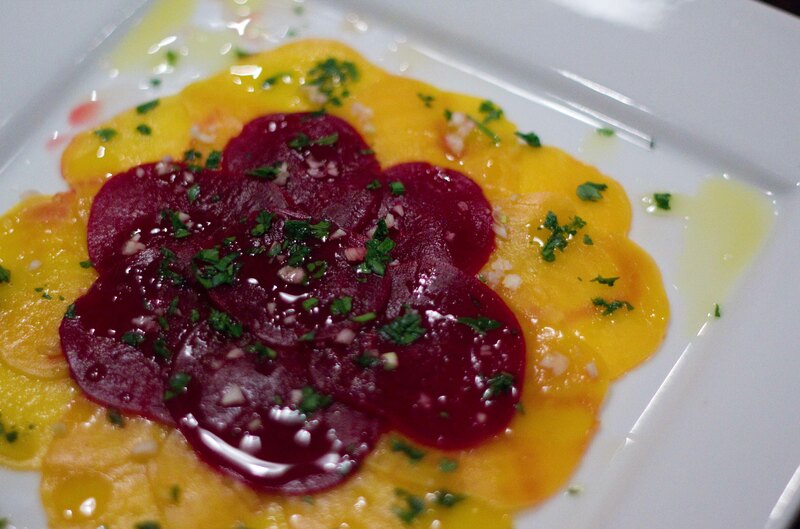 Inspired by the wonderful beet salad at Harvest Vine, I tried to replicate it at home. Remembering the description on the menu, (red and golden beets, olive oil, sherry vinegar, garlic) I wondered it that’s all there was to it. So I thought I’d take a shot at re-creating this dish at home. If I’ve learned anything from my years of loving food, it’s that simple tastes delicious when you use good ingredients. Also, food looks delicious when you use good technique and the right tools. 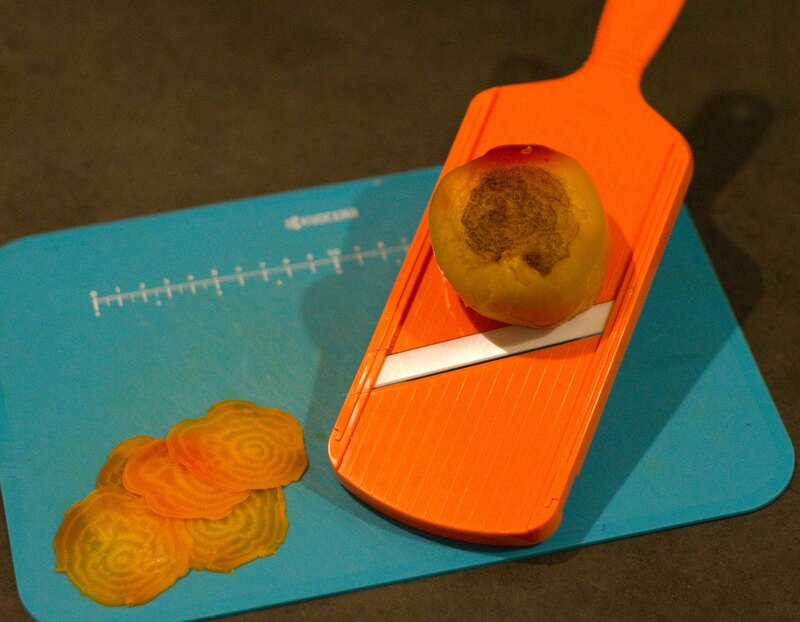 For this dish, I knew I would use one of my favorite kitchen tools, the slicer. Although I own the more complicated Benriner mandolin, my trusty ceramic Kyocera slicer is my go to tool. I went out and bought some lovely organic golden and red beets from the market and put them in some boiling water. I took them out when they were soft, ran them under cold water and was able to peel the skin off easily, (although it was hot!). I let the beets cool and then used my trusty slicer. I finely minced some garlic and parsley and set aside, (although next time I’d use the micoplane grater for the garlic for a finer texture). I plated the beets as gently as I could and topped them with the parsley, garlic and some nice salt. 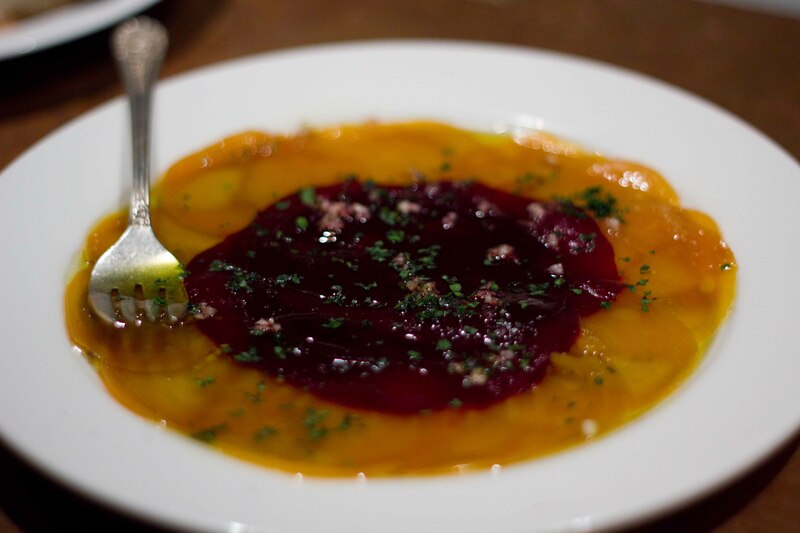 I topped the beets with Sherry Vinegar, (the best I could afford) and a wonderful olive oil I have from my trip to Napa. I let it sit a bit so the flavours could have time to develop. The verdict? Well, I’m always going to be lighter on the olive oil than you’d get at a restaurant so it wasn’t quite as luxurious, but this is a dish that I can see myself making over and over again. Yours looks better than the one from Harvest Vine. Thanks for saying that. I don’t know if it was better, but definitely better for you since I’m not as liberal with the olive oil.